I take a cautious approach to collaborative writing. It’s not that I don’t enjoy collaborating, or want very much for it to work out. it’s just that, in practice, it often doesn’t. And I’m speaking from experience. Lots of writing workshops, some blogs, personal projects, etc. have taught me to be wary. That said, I approached MixedInk with open arms, hoping that maybe a tool designed for the purpose would help make the process go more smoothly. 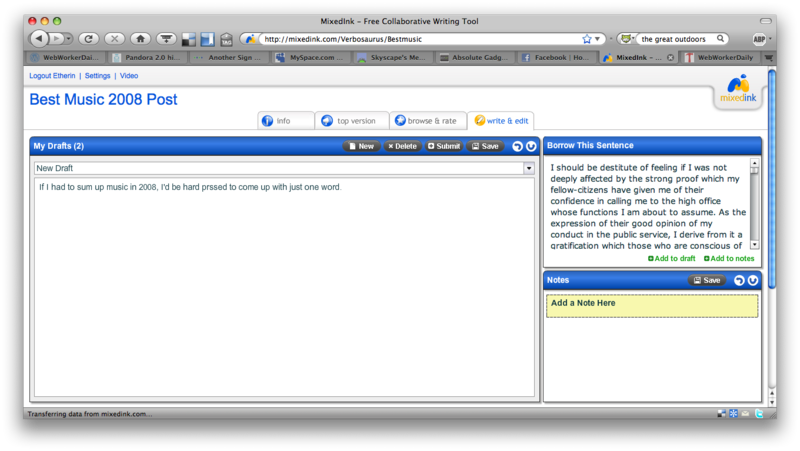 MixedInk is new free collaborative writing tool, which uses a democratic process that allows users to choose which bits stay and which get tossed. Slate.com is using MixedInk for an inaugural speech competition it’s holding, and their article about it here nicely outlines MixedInk’s features. As a web worker, I was more interested in how I might be able to use MixedInk to produce some collaborative entries for the writing blog I manage and edit. Most of the information I came across on the MixedInk site led me to believe that the tool was designed primarily with very large groups of people in mind, with the ultimate goal being community action, i.e. letters to congress, electoral campaigns, etc. I was pleased to find, however, that I could password protect my collaborative writing project, which means that I’d be able to limit authorship to a select group of my choosing. You can also send out invite emails during the set up of your writing project, or invite people after, once the group has already been established. Other options include setting a schedule and deadline for contributions. I went with the default, which is one week. Once I arrived at the dashboard, I discovered that the model MixedInk uses is more competitive than collaborative, in my opinion. Users post their version of whatever writing project is suggested, and then the posts are rated based on which users think is best. It’s a little like crowdsourced writing. Of course, you can always just browse and edit the works of other users who’re contributing, so that’s where the collaborative angle comes in. The editor also saves the original version (“top version”) so you can always go back if someone makes changes you aren’t happy with. It also auto-searches other drafts and public domain works in the database to provide suggestions if it finds any part of your work to be exceedingly similar to another. In the end, MixedInk does take some of the usual mess out of collaborative writing. Is it a practical tool for web working? I think it can be, but it requires some getting used to. So far, it has proved to be faster than emailing drafts back and forth, at the very least. MixedInk Demo from MixedInk on Vimeo. I prefer using Votorola to MixedInk. I used Votorola for writing my company’s 10-k report. Each department head used the website for collaborating on their section of the marketing plan, and then all sections were combined into one report. Unlike MixedInk, Votorola uses voter authentication, results verification, open aggregation, and public assent.